In the April 2011 issue of Catholic Mirror Rebecca Drake wrote a sensitive article on gluten intolerance and the Eucharist. In it, she interviewed Msgr. Daniel Liston, chancellor of the Springfield Diocese. Msgr. Liston stated that low-gluten hosts produced by the Benedictine Sisters of Perpetual Adoration in Clyde, MO are approved by the U.S. Conference of Catholic Bishops for use with those with celiac disease. Those for whom even the minimal amount of gluten is an issue may choose to receive the Eucharist only from the cup (which still contains the full Body and Blood of Christ). I am often asked, especially by young people, why I became a priest. Maybe some of you would like to ask the same question. Let me try briefly to reply. I must begin by saying that it is impossible to explain entirely, for it remains a mystery,even to myself. How does one explain the ways of God? Yet, I know that at a certain point in my life, I became convinced that Christ was saying to me what he had said to thousands before me: "Come, follow me!" There was a clear sense that what I heard in my heart was no human voice, nor was it just an idea of my own. Christ was calling me to serve him as a priest. And you can probably tell, I am deeply grateful to God for my vocation to the priesthood. Nothing means more to me or gives me greater joy than to celebrate Mass each day and to serve God's people in the Church. That has been true ever since the day of my ordination as a priest. Nothing has ever changed it, not even becoming pope. Faith and Family has a good article up today on When Spouses Disagree about NFP. It can certainly be a source of much guilt, pain, and resentment when one member of the couple wants to follow Church teaching and avoid artificial contraception and the other member doesn't. It can be even more difficult in a marriage when one member is Catholic and the other is not. As the article suggests, it is extremely important to keep praying and keep going to Confession. I came across this post today on dealing with pain from the past. No one gets through life without being hurt and hurting others. Everyone has things in their past that they regret or wounds that just won't seem to heal, no matter how much time has past. This article offers some concrete suggestions on how to cope. Maureen Whittmann offers an informative reflection on using the Socratic method with teenagers in this Catholic Mom article. One thing that I have learned in leading a history co-op over the past several years is that if I spend all of my time lecturing the children, they do not retain a great deal. However, if I engage them in conversation and ask probing question they make connections, come up with insightful conclusions, and retain their lessons. This is known as the Socratic Method. The method is, of course, named after Socrates. Perhaps somewhere out there are women who can completely empty their minds and focus totally on God. I’m sorry to say that I am not one of them - never have been. Just by way of example, there are times I have said an entire rosary and realized at the end of it that my mind was elsewhere the entire time. Book Review; "Pathway to our Hearts"
Archbishop Thomas Collins states "Lectio divina is a prayerful encounter with the word of God. By the 'word of God,' I do not mean simply the text of the Bible; I also mean Christ our Lord." "Pathway to our Hearts: A Simple Approach to Lectio Divina with the Sermon on the Mount" grew out of Collins' experience of lectio divina sessions he held at the Cathedral in Edmonton, Canada. He emphasizes that lectio divina is not the study of Scripture, although such study can be good preparation for it. Rather, lectio divina is an "intimate encounter with the Lord God through the medium of his inspired word in the context of prayer." Each chapter in "Pathway to our Hearts" is designed as a full lectio divina session, focusing on a section of the Sermon on the Mount. Archbishop Collins begins each session with the simple prayer "Speak, Lord, your servant is listening" and then an initial reading of the Scripture passage. He then goes on to offer his reflections on the individual verses. These reflections are truly powerful and insightful. Archbishop Collins invites reader to contemplate the deep meaning of these passages which have become heard so often they are sometimes glossed over. The Sermon on the Mount offers a blueprint for Christian living. It is the heart and soul of Jesus' teaching. The Archbishop delves into what it means to be pure of heart and to root out the evil desires that live within each of us. He offers a discussion of The Lord's Prayer and what it means to truly pray. He talks about the role of anxiety and judgment in our lives and what we should do about them. He encourages us to ask for God's help every day, to remember that "God is God and I am not . . . we acknowledge our reliance on God and on his power to save us." Lastly, we must always choose life. It is the narrow road; it is hard; but it is the choice Christians must make every day. The value of "Pathway to our Hearts" far exceeds its stated purpose. It is much more than a primer on lectio divina - it is an instruction manual for the Christian life. Even though I homeschool my children, I am an ardent supporter of Catholic Schools. I received a quality Catholic school education and want that to be available to others, including my own children and grandchildren should they wish to take advantage of it. I continue to donate to the schools I attended. While in some areas of the country Catholic Schools are thriving, in my area they are hurting badly. The vast majority of people simply can't afford to pay the tuition. Fewer people attend as a result, thereby raising the tuition per child. It is a vicious cycle. On Catholic Exchange today, Greg Fazzari offers an interesting alternative to the current per child way of figuring out tuition. It makes a lot of sense and should be given some serious thought by parishes and dioceses struggling to keep their school doors open. The comments discuss some of the philisophical pros and cons of the system. My local newspaper puts out a "Kids in Print" contest each year: http://blog.masslive.com/nie/2010/03/check_out_kids_in_print_today.html. It is a great program. However, I noticed that this year and last year almost all the winners are girls. Why is that? Do boys not enter the contest? Boys tend to lag behind girls in verbal development at least in the younger grades so that may be part of the explanation. I'm truly not sure, but as the mother of sons it bothers me. I don't want to take anything away from the young ladies who won - they did great work and I am sure the judges did all they could to be impartial. But, I do know that if the opposite situation were true - and the vast majority of the winners were boys, people would be up in arms about discrimination and the need to level the playing field. Have we reached the point in our educational system where the reverse is now true? Just some food for thought. On Fridays during Lent, Catholics are called to abstain from meat. However, March 25th is the Feast of the Annunciation, when Mary said her "yes" to God and changed the course of history. as a feast day, it is a day of celebration and not of fasting. Therefore, one can eat meat. Now, personally, giving up meat is no big deal for me as I don't eat that much of it anyway, but I am thinking indulging in some chocolate may definitely be in order! As many of you are aware, I have been privileged to write and work for Catholic Exchange for several years now. In October, I became an Associate Editor which is a position I am enjoying very much. What you may not realize is how much money it takes to operate a web site of that size and scope. We need your help in order to continue to provide the quality free content that Catholic Exchange offers on a daily basis. When my husband died two years ago, my greatest worry was the impact on his sons, aged four and seven at the time . . . How could I help them grow into wholeness and happiness with that gap looming so large? . . . what is true of course is that those of us with still-living parents must learn a similar lesson: Our earthly parents are limited and flawed. They can't fill the role that only our heavenly Father can. As parents, we can sometimes feel like it is all up to us. This Gospel passage and Welborn's reflection remind us that God is our true Father. We have earthly parents and if we ourselves are parents, He has entrusted some of His children to our care temporarily, but He is the one who created us and loves us. We and our children ultimately belong to Him. Heidi Hess Saxton has been running a great series for Lent on her blog over at the Extraordinary Moms Network. Today's topic was gratitude. This is one I have such a hard time with. I'm not a naturally optimistic person. It is hard for me to see the good in life. I see the hurt and feel the pain. I try to see the bright side - really, I do, and I do have my moments. But, it is definitely something I need to work on. I can always use the reminder to "be thankful," both to others and to God. Thanks, Heidi, for reminding me today. With the exception of the above scenario, the sign of peace is part of Mass that I never really thought about all that much. Most weeks, I simply extend a friendly greeting to those near me, and then Mass continues. Pathway to our Hearts, a new book by Archbishop Thomas Collins, invited me to give it greater consideration. I have always found stories of Guardian Angels fascinating. 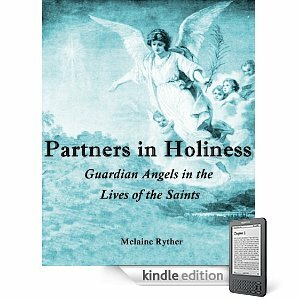 For this reason, I was very excited to have the opportunity to review "Partners in Holiness," a new ebook by Melaine Ryther that focuses on the role of Guardian Angels in the lives of the saints. 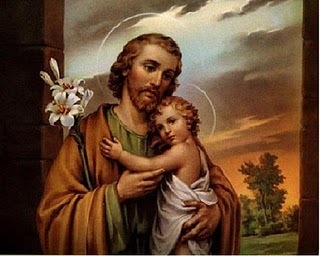 "According to St. Thomas Aquinas, an angel takes watch over a person's body and soul at the very moment of birth. All of us, whether we are saints or sinners, believers or skeptics,have guardian angels who: protect us from physical and spiritual harm; pray for us constantly before the throne of God; inspire us with good thoughts; incline us toward virtue; drive away evil; strengthen and console us in our sufferings; and eagerly await our prayers so that they may help us even more. The angels want us to become saints. And everything they do for us is a means to that very end." Ryther shares the stories of how Guardian Angels manifested themselves to some of the saints. Pope St. Gregory the Great saw his angel as a poor merchant whom God had sent to test his charity. St. Isidore's angel did farmwork. St. Margaret's angel provided comfort and taught her. St. Lydwine, who was confined to bed, had an angel who took her on trips both to places in this world and the next. St. John Bosco's angel appeared as a grey dog who provided protection whenever he needed it. Tales of St. Rose, St. Frances of Rome, St. Gemma Galgani, and St. Padre Pio are also included. These stories are fascinating and serve as great evidence of the powerful role Guardian Angels can play in our lives. "Partners in Holiness" was written to not only educate readers about the power of Guardian Angels but also to encourage us to call on them daily. All we need to do is ask for their help. All we need to do is ask. "Call on them and honor them frequently," St. Francis de Sales says of the angels, "and ask their help in your affairs, temporal as well as spiritual." They are our partners in holiness, every day of our lives. Dates: Students arrive the evening of Thursday, August 4th and depart after 1:00pm on Sunday, August 7th. Holy Mass and lunch are offered on Sunday. Cost: $199, including tuition, room, and meals. This retreat is based on a traditional education given to artists to develop their ability to apprehend beauty and open them up to inspiration. As such it is appropriate for artists, but would be of interest to anyone who wishes to be more creative in whatever they do. With a focus on the artistic and architectural traditions of the Church, we will learn how these rhythms and patterns permeate the whole of Catholic culture and are reflected, for example, in traditional ideas of proportion and harmony. 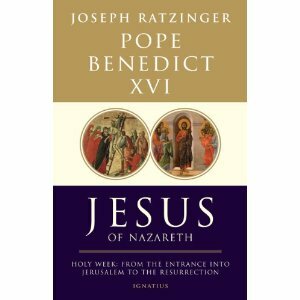 The course also draws heavily upon the writings of the Church Fathers and Popes John Paul II and Benedict XVI. Previous training in art is not required for the Way of Beauty Summer Retreat. 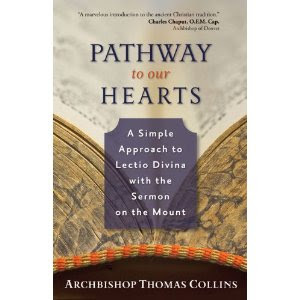 I am currently reading Pathway to Our Hearts: A Simple Approach to Lectio Divina With the Sermon on the Mount by Archbishop Thomas Collins. Our faith does not tell us that life will be a happy, happy time. "Have a nice day" is not our prayer. The happy face is not our sign. Our sign is the cross of Christ. My daughter, suffering will be a sign to you that I am with you (669). Dear Jesus, I have always been afraid of suffering. I don't like pain of any kind, and I fear being abandoned and alone. Teach me to trust that you won't abandon me in the midst of my suffering, but that my suffering is a sign that you are with me in a special way. My Lord, help me to trust in this truth and not run away from trials. Help me to realize that You are always very close to me and never more so than when I am in the midst of some type of suffering. Want to promote a pro-life cause, renew your spiritual life and connect with other Catholic women? Then plan on attending the 4th annual Catholic Women’s Conference at Cathedral High School in Springfield on April 16th. The special collection for the day is for Rachel’s Vineyard which ministers those whose lives have been touched by an abortion. Sister Olga of the Eucharist, whom many call a modern-day Mother Teresa, and Antoinette Bosco, a gifted author and columnist, will be the speakers. There will be exhibitors, a healthy lunch, time for confession, Eucharistic Adoration and Mass. It promises to be a beautiful way to begin Holy Week. Call 452-0812 or log onto http://www.diospringfield.org/womensconf.html. was written by Sister Barbara Anne Hallman, OSF, the aunt of a friend of mine. The book is beautifully designed and offers a series of short reflections on topics such as "A Quiet Place," "Healing Touch," "Caring for our World," "Suffering" and "The Journey Home." Sister Barbara Anne is a Christian very much in love with God; a woman very much in love with life; a Franciscan very much in love with nature. Sister has spent years joyfully and compassionately serving the elderly sisters of her community. She is a member of a loving family who taught her the importance of treasured friends, of which she has many. Sister's contagious laugh and ever present humor have led her to be a great storyteller. Her gift of tears has led her to be an attentive listener. The combination of these characteristics have given Sister the ability to lead others into deep introspection and contemplation. Sister Barbara Anne uses her love of scripture, her gift of creativity and her openness to others to direct group and private retreats, to speak at various conventions, and to be a spiritual companion. 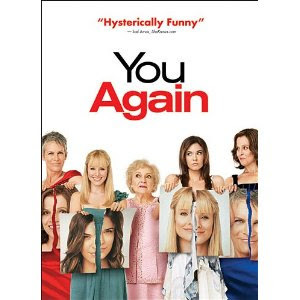 Sister's personal friendships with many of the elderly sisters have made the writing of her book a joy, a personal journey, a reflection on the challenges of aging. It has also strengthened the values she has learned from these holy women. Sister Barbara Anne now resides at Our Lady of Angels Convent in Mishawaka, Indiana. When she is not engaged in prayer or study one may find her reading, painting or working with stained glass. The richness of her life experiences, her willingness to reach out to others are captured in Hands That Hold Hearts. My older son is turning 10 soon, and I was looking for a prayer to say with him to help him discern what God wants him to do with his life. At Bible Study the other day, I came across this prayer in a book we were using. Dear Lord, I'm approaching the age where I am thinking more and more of what you are calling me to in life. I thank you for the gifts you have given me and ask that you give me the strength and direction to use my gifts to their fullest. Help me never to be lazy or indifferent, rather to always desire to serve you. Lord, to what are you calling me? Do you want me to be a teacher, a coach, a cook, or a carpenter? Am I to serve you as an executive in an office, a salesperson, in the field of medicine, manufacturing, a homemaker, or something else? Are you calling me to be married or single? Help me, Lord, to be open to whatever vocation you are calling me to including the special vocation of priesthood or religious life. Ultimately, Lord, I know that you want me to help make the world a better place, a more holy place in whatever profession you desire for me. I can only do that if I walk with you. I know you want me to be happy in my life's work and I confidently prayer that you will show me the way. In Jesus' name, I pray. Amen. There is a lot of truth to these lists and they provide more evidence that we need to be kind to ALL mothers! 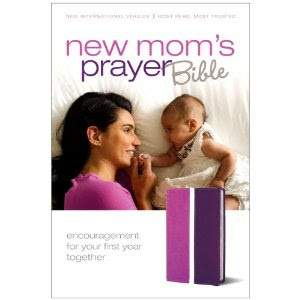 Book Review: "New Mom's Prayer Bible"
If you have a Protestant friend or family member who is expecting or recently given birth, The "New Mom's Prayer Bible" would make a lovely gift. It can be so hard to focus on one's spiritual life during those sleep-deprived emotionally exhausting days of early motherhood. Time to pray and do spiritual reading is at a minimum. This New International Version of Scripture is designed with the busy mom in mind. Interspersed throughout the pages of the Bible are several inserts - each of which focus on four topics. For example, a few of the topics included are Restoring Relationships, A Dose of Kindness, Enduring Pain, and Storms of Life. Each topic includes a 1 minute, 5 minute, and 10 minute option to reflect, pray, and study that topic. Other features of this Bible are a concordance, maps, and 5 minute reading plans. It has a soft leather cover which makes it pleasurable to hold and allows it to open flat. While it is advertised as a "New Mom's Bible," this Bible would actually be perfect for any busy woman seeking to add more Bible reading into her life. Jesus was taken down from the cross and his lifeless body was laid in his mother's arms. The pain Mary must have felt as she held her son. She was the mother of a convicted criminal. Truly a "sword had pierced her heart." that we may share in Your abundant life. Encourage us to act out of love in Your name. and bring us closer to You and each other. As we begin Lent, we enter a time in which we are encouraged to undertake a self-denial, a fasting that will benefit not simply ourselves but others, a time to perform an in-depth evaluation of where we are going with our lives, especially in terms of our Christian values, a time to contemplate our mortality and repent of our sins, a time for an assessment of our potential as spiritual beings, made in the image and likeness of God. We examine where we're falling behind in our spiritual growth and make fresh resolves to carry on in our Christian calling with renewed vigor and enthusiasm. The mood is somber, yet full of promise. It is a journey from ashes to Easter. I wish you all a very blessed and fruitful Lenten season. Where does this Lent find you? Isn't that something that we all need? A clean heart (and mind) and a steadfast spirit? I find that each year when Lent rolls around, I am in a different place. There is always something I need from Lent. That is one of of the beauties of the Liturgical Year. Imagine having Lent only once in your lifetime! The Church in its wisdom figured out that we need this time set-apart for repentance and sacrifice on a regular basis. We need to do the hard work of looking at our spiritual lives more deeply. Where are you in your life right now? What is God asking you to bring to Him during this holy season? 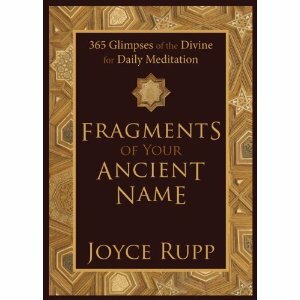 What aspects of your spiritual life have been neglected during the past year? What pain needs to be laid at the foot of the cross? The six weeks of Lent offer us a wonderful opportunity to focus on our spiritual selves - to work on that clean heart and steadfast spirit. I hope and pray that this season is a fruitful one for each of you and that by the time Easter morning comes you are truly able to rejoice and say "Alleluia, Christ is Risen." While this article: A Confess-a-thon is Coming is mostly for Springfield, MA Catholics, it is a good reminder to all of the importance of going to Confession. Find out when your local parishes are offering Confession this Lenten season and be sure to go. Yes, it is hard. It is humbling. It is also very worth it. You will feel much better leaving than you did going in. We can all use a good soul cleaning on a regular basis. We clean the outside of our bodies. How much more important it is to clean the part of us destined to live forever. The three traditional pillars of Lenten observance are prayer, almsgiving, and fasting. The three are intimately interconnected and all help us to become more loving. 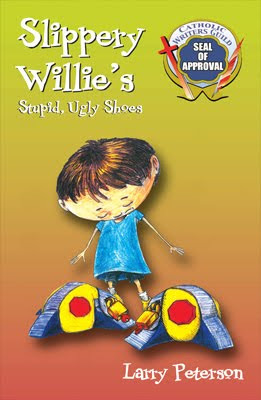 Book Review: "Fragments of Your Ancient Name"
Book Review: "Slippery Willie's Stupid, Ugly Shoes"
Some studies estimate that as many as 1/3 of American women have had an abortion in their lifetime. If you or someone you love is struggling to cope with the aftermath, http://www.abortionchangesyou.com is a website dedicated to helping people share their stories and move on the road to healing. It is not only for post-abortive women, but also others who have been impacted by abortion - grandparents who have lost grandchildren, siblings who have lost a brother or sister, or fathers who have lost a child. For a Catholic resource for post-abortive healing, please visit Rachel's Vineyard. * a time for the sacraments, emotional support, and the healing power of laughter! Faith and Family magazine has been inspiring Catholic family life, and Catholic moms in particular, both in print and at their vibrant website www.faithandfamilylive.com for many years. Now, Catholic moms are invited to this inaugural live event scheduled for Saturday April 2, 2011, at St. Patrick’s Parish Hall in Stoneham, MA, 8am - 5pm. This Moms-only “day away” is designed to inspire and energize mothers for their important work as they joyfully celebrate their Catholic Faith with other Catholic moms. Moms will be spiritually “pampered” with prayer, socialization, relaxation, and inspirational talks. - Danielle Bean, editor of Faith and Family, and author of three books on the subject of mothering, including her latest, Small Steps for Catholic Moms (Circle Press, 2010). - Rachel Balducci, blogger at Faith and Family and Testosterhome, and author of How Do You Tuck In a Superhero? : And Other Delightful Mysteries of Raising Boys (Spire Books) , (Revell, 2010). - Jennifer Fulwiler, blogger at Conversion Diary, and at the National Catholic Register. Schedule for Sat. April 2, 2011: Doors open, 8am. Conference hours 9am - 4pm. Attendees are invited to attend the Parish Vigil Mass at 4pm. Morning break and lunch is included in conference fee. Cost & Registration: $40.00 per person, seating limited to 200. Faith & Family welcomes Bible Toys (http://www.bibletoys.com) as the day’s sponsor. Looking for On-line Catholic Education to supplement your homeschool or public school program? The mission of GRACE VIRTUAL CATHOLIC EDUCATION PROGRAM is to provide a rigorous and affordable Catholic education based on the foundations of the Catholic Faith and sound academics. These foundations enable our students to become individuals who value and live their faith. Committed to the highest standards of academic excellence combined with collaborative technology, we dedicate ourselves to provide the best possible education for our students by developing the knowledge, attitudes, and skills essential for life-long learning. As a community grounded in the Catholic faith, GRACE seeks to inspire its students and encourage them to live according to the Gospel of Jesus Christ. The GRACE VIRTUAL CATHOLIC EDUCATION PROGRAM was founded on the belief that it is the responsibility of Catholic educators to make a rigorous Catholic education available to more families. Based on over 80 years of delivering authentic and rigorous Catholic education, the GRACE VIRTUAL CATHOLIC EDUCATION PROGRAM is Purcell Marian High School’s response to the belief that the cost of such a Catholic education has grown beyond the reach of Catholic families around the world. In our quest to meet our objective, GRACE has leveraged the power of technology and global broadband networks, while combining the rich tradition and excellence of Catholic academic excellence. This has been accomplished by obtaining the intellectual capital and resources of its technology partner CBTS along with the combined input and council of several Catholic dioceses, universities and Catholic educators around the country. Additionally, GRACE has reviewed the top virtual school courses from around the globe and selected the course partners that best accommodate the unique needs of Catholic schools, home school families and individual Catholic students. GRACE believes that it is also important to connect Catholic students, faculty and other Catholic schools around the world through a safe and monitored Catholic network. The GRACE network expands beyond academics by creating dialog with an open means to view the world through the eyes of our Catholic brethren in the far reaches of the planet. It is our desire to educate and evangelize while building a strong, knowledgeable, service-oriented Catholic community both virtually and within the walls of schools, homes and churches throughout the globe.